79% of marketers cited finding the right influencers as a top challenge for their brand (Source: Econsultancy). By using a data-driven approach that focuses on the content your customers care about, you can find beauty influencers who align with your brand story. While manual identification processes can be beneficial in the infancy of your influencer program, they often won’t scale. Cobbling together adhoc methods to find influencers is not only time consuming but it can also cause a cognitive bias to occur. Bringing technology to support your identification processes eliminates any biases that you or your team might have about who influences your buyer. This allows you to make data-driven decisions that scale. The following outlines a content-led identification approach leveraged by Traackr customers when implementing their influencer marketing. Note that the following data is publicly sourced and is an example of the searches that our customers can run. The key to finding influencers begins and ends with context. That’s why we recommend using keywords being mentioned in content when identifying new influencers. These keywords should be niche topic conversation words. For example, if you are launching a new eyeliner and searching for subject matter experts, your keywords might include “cat eye”, “angled eyeliner brush”, “gel eyeliner” and “liquid eyeliner”. On the other hand, if you are looking for influencers to partner with for a natural makeup look your keywords might include “natural look”, “glowy foundation”, and “no-makeup look”. Pro tip: You can find contextually relevant keywords across influencer content, trending hashtags, and popular search phrases. See below for a general makeup and cosmetics keyword set from the Traackr platform. Let’s say you’re looking to see which influencers are talking about an up-and-coming beauty brand, such as Glossier. By inputting basic information including brand name, brand handle, and a few product keywords, Traackr is able to tell us who is mentioning these keywords the most online, provides links to all their social profiles, and gives us a glimpse at their total audience size. The search results include Kelsey Dadmun, Sofiia Strykova, Grace Tan, Stephanie Zheng, plus Glossier’s Founder and CEO, Emily Weiss. 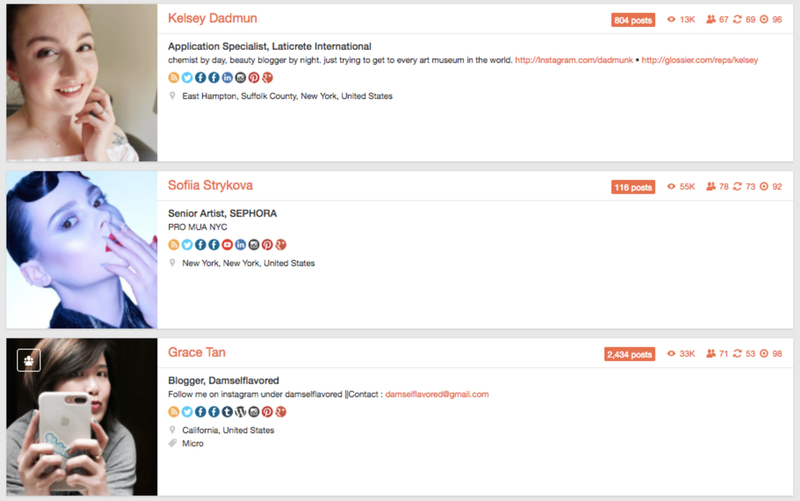 As a huge Glossier fan, I loved seeing Emily Weiss listed among Glossier’s top influencers. Executive influence is gaining popularity because it not only elevates the company’s influence but also helps to humanize the brand image. Key Takeaway: When looking for influencers already talking about your brand search for words, phrases, hashtags, and handles relevant to your brand across the platforms that are most relevant to you. Let’s pretend that Anastasia Beverly Hills is a competitor of yours. By using the keywords below you can quickly see which influencers are mentioning your competition. 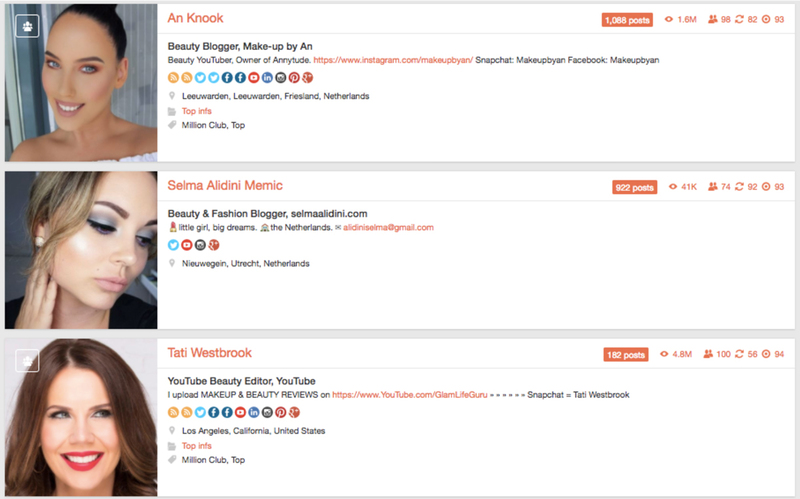 Influencers that rank highly for Anastasia include An Knook (1,068 mentions! ), Selma Alidini-Memic, Tati Westbrook, Katy Komaromi, Tammy Williams, and Lotte De Jonge. Key Takeaway: To discover which influencers your competitors are working with, search words, phrases or hashtags relevant to their brand. This will help you better understand which influencers they are already working with and highlight opportunities for you to get on these influencers’ radar. Identifying influencers who are aligned with your brand mission is important to building long-term relationships. 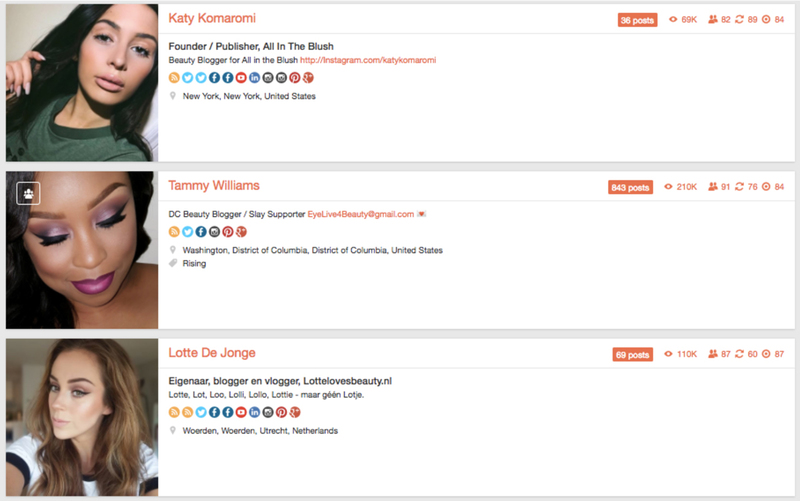 Let’s say Origins is searching for like-minded influencers. While Origins creates all natural skincare products they are also committed to their customer’s well being in addition to the planet’s. From how they test their products, to their Plant-A-Tree program, Origins keeps the impact on the earth in mind. For this search, the keywords below were used because they touch upon Origins values. 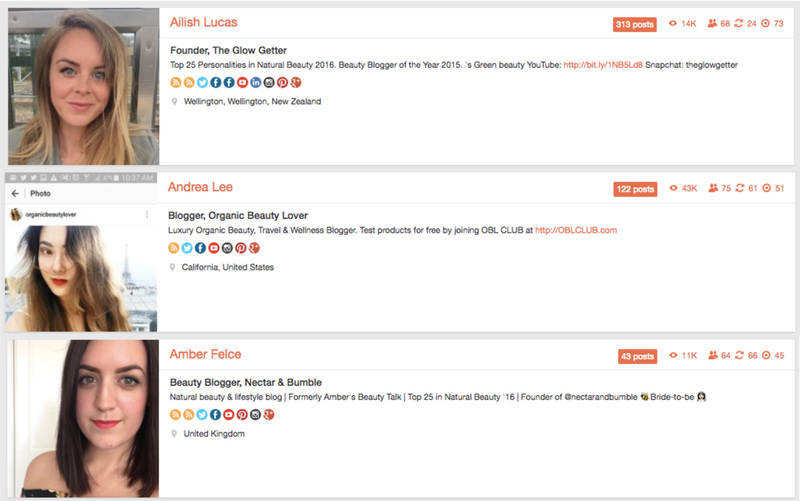 Top influencers on these topics include Amber Felce, Andrea Lee, and Ailish Lucas. Key Takeaway: By searching for influencers aligned to your brand’s core values, it will be easier to turn them into brand advocates because it's more authentic. These influencers will be more likely to share your brand’s story and have ideas for long-term partnerships. After you have picked out which beauty influencers would be a good fit for your brand, the manual vetting begins. Vetting influencers means understanding their content, who they are, what they stand for, and where your interests overlap. This process takes time, but can be simplified with technology. Identifying influencers with keywords is only an introduction into the ways a platform can help streamline finding influencers. Traackr enables marketers to identify which influencers are trending and filter by tier (micro, middle, macro), location, demographics, and social channel. Stay tuned for the next post in this beauty series to see step-by-step how this works. We hope you’re feeling inspired to find the right influencers for your brand, then start building relationships with them. Check out our newly refreshed Guide to Influencer Marketing to become even more acquainted with influencer identification (and what comes next). If you’re curious to learn more about how Traackr enables enterprises and agencies to build, scale, and measure influencer relations, join an upcoming demo and see the tool in action.